I posted in 2013 about a double die penny and a thunderbird silver ring I found, here it is 2015 and with the same Prizm II, two days ago(3-19-15), in my back yard!, I found 30 mexican five peso coins dated in the 1800s and 20 one peso coins, it was in a trash pile, I disregarded the signal!. My prizmII kept showing silver but I was finding trash, but two days ago I thought I should keep digging, I'm glad I did! In a few old canning jars I dug up the coins! I really am impressed with my prism ll, I dug a lot of trash at first though, and found only one ring, a silver thunderbird, as I was digging up every signal. Now listening to the tones and looking at the screen my collection of pre 1960 coins( including a 36 wheatback double die) has drastically increased. I like whites prism ll! Just returned to Ohio from a 4 day stay at Virginia Beach. I got to use my Prism II for the first time on the sand. In the 4 hours or so I spent on the beach, I ran the sensitivity all the way up and dug everything it beeped at. I pulled pop tabs, aluminum foil, screws, tent stakes, coins and just about anything else metal you could think of out of the sand. The Prism II can and will find a needle in a haystack so to speak. I had a ball. On the second day, my wife drug my kids and I out to the beach about five am to watch the sun come up. I grabbed my Prism II and I kid you not, I hit a spot, reached into the sand and pulled out a beautiful stainless steel necklace with a large cross and diamond in it. My wife and kids could not believe it. This was my only jewelry find but that's OK because there were always people out there with detectors at all hours hunting. I am a 41 year old man and I had no problems learning the different settings and identifying the different sounds this detector makes. You will not go wrong with a Prism II. I wanted a basic detector to start, without spending a lot of money until I knew metal detecting was something that would hold my interest, so I bought a Prism 11. I watched the tape and read the instructions first and started hunting in my yard for practice, immediately, I started finding coins, pull tabs, bottle caps, foil, etc. What I found out is, it takes lots of practice to use this or any detector proficiently and yes you are going to dig a lot of junk for a while, any detector is only as good as it's operator and there is no detector to my knowledge that can tell you with 100% accuracy that you will find exactly what the machine tells you is there quarters, dimes, nickels,etc. If you will look at the pages of reviews online, one person will tell you it's junk, the next one will say it's a great detector. If you are a beginner, in my humble opinion, this prism 11 is a good simple, reasonably priced, machine to start with, I paid for mine with one gold ring, everything since has gone into my collection. You may never get rich, but it is a lot of fun. Having used many detectors over 30+ y years I would still have to say I was impressed by the depth and ease of use. Almost turn on&go Fairly accurate ID, and a copper penny recvered at a measured depth of 11". High price, and lack of interchangle search coils are the only disadvantages I noted. Hopefully, by now auxiliary coils are offered. Terrible unit my 40 dollar bounty hunter is better than this prizm 2. It was unstable beeped on everything and modes were useless dont buy this thing its Junk sold it right away. I recently purchased a whites prizm 2 and am very impressed with this machine, this unit is definatley not a toy, it is a real detector. I have owned and used a minelab muskateer, bounty hunter tracker 4, garret treasure ace and a tesoro silver umax and have not been really satisfied with any of them. I found the minelab was too heavy and had my arm aching within a short period of time, the tracker 4 would only get a depth of 4 inches but was easy to use, the treasure ace just didn't inspire me, the silver umax would be my pick out of these until I used the whites prizm 2, I found the prizm not only relatively cheap it has a very solid feel to it, is a good looking detector, light weight, can be used for hours without arm fatigue and the depth it gets for a very affordable detector is outstanding. It is very easy to use and will find coins and jewelery with ease. I have been metal detecting for a few years now and would definatley have faith in whites and use my prizm 2 quiet often and with great success and confidence. If u are looking for an affordable, lightweight, effective coin and jewelery finding machine that won't break the bank, do yourself a favor and check this detector out, it may not have all the bells and whistles of the expensive machines, but has good features for a machine of this price, and to be honest doesn't need all these bells and whistles for coin and jewelery finding. Thanks whites for making this machine and making me a successful treasure hunter and making it at a very affordable price. These views are my personal opinion and is not intended to offend or run down any manufactures, all of the machines mentioned here work OK but my choice overall goes to the whites prizm 2. If by chance you do not like this detector you must be very hard to please. I purchased a Prizm 2 last week purely because it was cheap and wanted to see how it performed. Discrimination is excellent. You will not dig iron with this machine. I passed a hammer under the coil and-NOTHING! Foil is also discriminated but the pull tab area is the dodgy area as with other detectors. Modern 5ps and 10ps are ignored as are post 1947 shillings and sixpences. If you want these you will have to dig the ring pulls. However the earlier decimal 10ps are retained. Nothing else is lost on these settings. I've found rings can register just about anywhere on the upper 2/3 so this means digging the tabs again. Depth is fairly good. I found a lizzie2 halfpenny at 8" loud and clear. This machine loves £1 coins and any copper/bronze/iron combination. I had a go in a kiddie barkbox and my pocket was full of 1ps, 2ps and 11 pound coins. I found only 1 10p and that was by accident as the ring pulls were a nuisance. ONLY dig those repeatable signals or you will go mental. A nice clear tone is what you are after. Once you get used to it, its a good starter machine and maybe a bit more. I was recently introduced to metal detecting by my older brother. He uses a Whites DFX and told me Whites is a good company. About 8 months ago I purchased a Whites PrizmII cause its really all I could afford. I found it really easy to use and really light weight as compared to the higher models. With the PrismII and being a beginner I have been really surprised at the quantity of coins and relics I've been finding. So far I have found about $300 in modern coins and many older coins including some silver. My favourite finds so far have been an 1864 Two cent piece and a 1903 Barber dime. 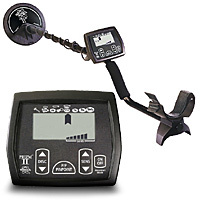 For anyone looking for a cheap easy to use metal detector Whites PrizmII is the way to go, ANYONE can use this machine with ease.